Allows you to easily and safely remove embedded dirt, fallout, rail dust, etc. Gyeon Clay Course will help you remove embedded contamination in your paint safely and easily! When driving, the various contaminants your car comes in contact with on a daily basis, can really do damage to your paint. Rail dust, brake dust, industrial fallout, dirt, grime, etc. can embed itself into your clearcoat, which can lead to pitting, swirls, scratches, and over time, rust or clearcoat failure. With a clay bar and clay lube, you can safely and easily remove this embedded contamination, allowing you to avoid any future issues and help you prep your paint for polishing and protection application. With the two great Gyeon clay options, you can clean up your paint with ease! Gyeon clay bars are synthetic detailing clay bars, which are ideal for all types of paint, clear coats, ceramic clear coats, etc. There are two awesome options, the Clay Course for heavily soiled vehicles and the Clay Mild, perfect for lightly soiled vehicles. Choose the bar that best suits your needs, spray the desired panel with the Gyeon ClayLube and glide the bar across the surface. What you will be left with is a surface that has improved cleanliness, slickness and clarity. Contamination such as paint overspray, tree sap, bug residue, industrial fallout, and stubborn dirt is commonly overmatched by the cleaning power of this bar. Don't let embedded contamination sit on your paint, use the Gyeon Clay Course to easily remove it! Efficient way to remove contamination. Safe for all automotive finishes. 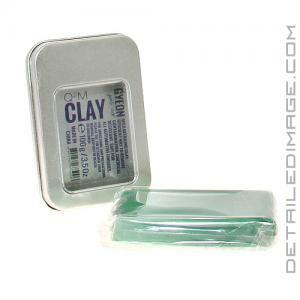 I bought most of the clay bars on this site and have found this one to be my favorite but DI did not carry it. I emailed them and asked if they could. Not only did they get it but it was available within 2 weeks to order. Great customer service and an awesome clay. Some types of clay leave residue on the surface or are not tough enough for heavy decontamination. You cannot go wrong with using a nanoskin mitt/ iron-x and going over heavy spots after with this clay. Let me start by saying that I'm a HUGE fan of Gyeon products. That said, I would not recommend this product for purchase. I found this clay to be extremely difficult to form and work with especially given the fairly significant cost. Let me be clear in saying that this did remove contaminants, but there are many other products that'd I'd recommend to do the same job, but more efficiently and more easily. Anyone looking at this should consider some of the other synthetic clay mitts, dowels, etc. offered by Nanoskin before utilizing this product.